The elbow joint is pretty simple on its largest scale, but when you start to add in different muscles, nerves, and blood vessels, it can become quite confusing. The elbow is quite similar to the knee in terms of overall function, but obviously serves different purposes since it is located in the upper body and not under the full weight of the body. 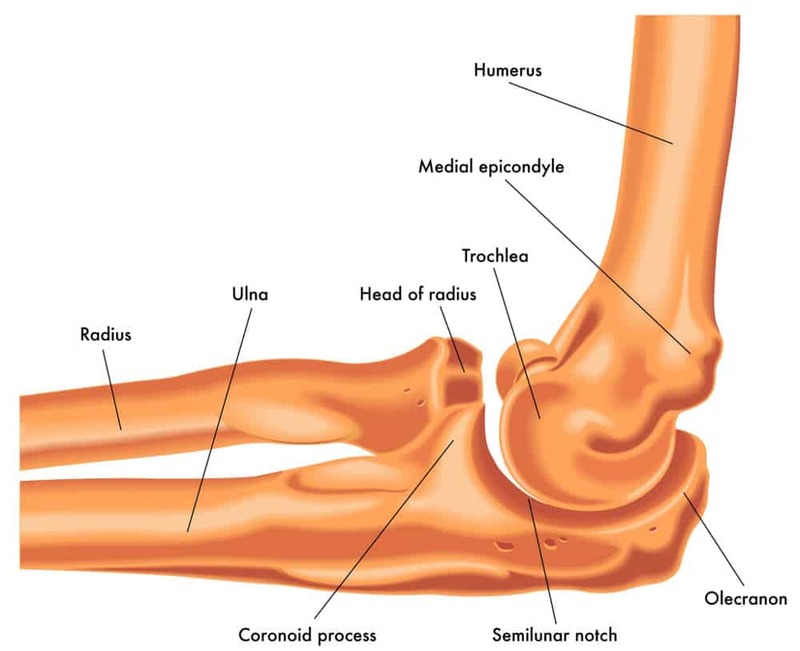 Therefore, in this article, we would like to highlight the most important information about the anatomy of the elbow joint without going into too much detail about the specific structures, but then wrapping up in way that brings it all together. We hope you find this information useful! The bone of the upper arm is called the humerus. This forms the proximal portion of the elbow joint. Then, there are two bones on the distal side of the joint. That is, the humerus connects to two other bones to form the joint. These two other bones are the radius (larger) and the ulna (smaller). The radius is on the lateral side of the arm, which is the thumb side. The ulna is on the medial side of the arm, which is the pinky side. So if you're standing with your arms down but palms facing forward, the radius is on the outside of your forearm and the ulna is on the inside closest to your body. View of the elbow joint looking from the medial side of the elbow and flexed to 90 degrees. So while the elbow is often simplified into one joint, there are actually three different articulations within the joint capsule. One is between the humerus and the radius (humeroradial joint), another is between the humerus and the ulna (humeroulnar joint), and the last one is between the radius and the ulna. The latter joint is specified as the proximal radioulnar joint because there is also a similar articulation further down at the wrist, which is identified as the distal radioulnar joint. ​There are three main ligaments in the elbow: The ulnar collateral ligament (UCL), the radial collateral ligament (RCL), and the annular ligament. You may also see the UCL called the medial collateral ligament (MCL), and the radial collateral ligament is sometimes referred to as the lateral collateral ligament (LCL). In our opinion, both are equally valid, but given the ligaments of the knee are more commonly called the MCL and LCL, we prefer to use UCL and RCL when talking about the elbow just to avoid any potential confusion. The UCL is a very important ligament that connects the humerus with the ulna, and it is especially important clinically, as this structure is highly vulnerable in sports that involve throwing, especially with maximum power. For example, pitchers in baseball are way more likely to tear their UCL ligaments, as the shear torque that is placed on the joint in each and every pitch can lead to damage of the ligament. If you're looking at pictures of the elbow ligaments, y​ou may notice that it looks like there are three separate ligaments on the ulnar side of the joint. These all fall under the UCL, but can be distinguished by labeling each band according to its orientation. In this case, we have the anterior, posterior, and oblique bands. The RCL ​is similar to the UCL, as it originates on the humerus and crosses the joint to connect to the head of the radius. However, there is only one main band of the RCL, which is fairly bigger and tends to have more of a fan shape. This ligament can be injured, but it's still more common to see UCL injuries. Injuries to the elbow that involve the joint itself (e.g. dislocation), bones (e.g. fracture), or ligaments (e.g. sprain or full rupture), especially if they involve surgery, can often benefit from a hinged elbow brace for post-op treatment. The annular ligament is interesting because it doesn't cross the full elbow joint. It basically acts like a stiff elastic band that hold the head of the radius down to the radial notch of the ulna. In this way, you can consider it as both originating and inserting ​into the ulna, but wrapping around the head of the radius in the process to keep it snug in the radial notch of the ulna. The bones of the joint fit nicely together like a puzzle, but we still need some more stability to have full functionality. The ligaments, combined with the fibrous joint capsule, provide this additional strength and stability by passively reinforcing the joint from virtually all external aspects of the joint. Muscles, which are active in the sense that they provide movement, add an even more strength and stability to the joint, which is where we now turn our attention. This is a bit of a weird title because muscles generally aren't classified according to the joint the cross. In the case of the elbow, it gets especially confusing because there are a lot of muscles that cross the elbow joint. Some act only on the elbow, while others act on both the elbow and the wrist, and all have different specific actions that combine to form the smooth motion that our arms are capable of, incorporating strong movements and fine movements into one package. The main muscles of the upper arm are the biceps brachii, which can ​be broken down further into the long head and the short head of the biceps brachii. These are the well-known biceps muscles in the classic flexing pose. The biceps brachii are responsible for elbow flexion, as well as supination when the elbow is flexed (e.g. turning your forearm over as if to receive change form a purchase). The other upper arm muscle that crosses the elbow joint on the anterior/front side of the elbow is the brachialis, which is located just deep to the biceps brachii and also helps with elbow flexion. There is another muscle in the upper arm called the coracobrachialis, but this only acts on the shoulder joint, as that is the only joint it crosses. All of these muscles on the front side are innervated by the musculocutaneous nerve. The triceps muscle is located on the back of the arm and is responsible for elbow extension, so essentially the opposite of the biceps muscles. The triceps is broken down into three heads - the long head, the medial head, and the lateral head. All of these triceps muscles are innervated by the radial nerve, and they all perform elbow extension, but each head has its own particular assisting functions at the shoulder joint as well. There are also a bunch of forearm muscles that originate on the medial and lateral epicondyles of the humerus, which are the two bony prominences very close to the actual joint. These muscles generally break up into two groups. The muscles that combine to form the common flexor tendon and originate on the medial epicondyle are generally responsible for wrist flexion (among some other actions), whereas those that combine to form the common extensor tendon and originate on the lateral epicondyle of the humerus are typically responsible for wrist extension (among some other actions). These forearm muscles include 1) Wrist flexion = pronator teres, flexor carpi radialis, palmaris longus, and flexor carpi ulnaris, and 2) Wrist extension = brachioradialis, extensor carpi radialis longus, extensor carpi radialis brevis, extensor digitorum, extensor carpi ulnaris, and the extensor digiti minimi. We know that the focus of this article is the elbow, so it's important to note that while these muscles have lots of dynamic action at the wrist joint, they also have some actions at the elbow joint, and they also add a lot of strength and stability to the elbow joint overall. ​So the point here isn't to go into detail about each specific muscle, but instead, simply provide you with an idea of how much is going on around that joint, and a typical sense of how the arm works and is arranged. It's especially important when considering conditions like tennis elbow or golfers elbow, as these tendons are critically important to the development and treatment of those conditions. Again, we will try to keep this brief and focus on the main vessels, ​as there is a lot going on around the elbow joint. Let's start by considering some of the main nerves that cross the elbow joint. The radial nerve, which supplies the triceps muscles on the back of the arm, eventually loops to the front side of the arm just before crossing the elbow joint. ​It crosses just over the radius, which is on the lateral/outside portion of the arm. The radial nerve splits into two main branches - the superficial radial nerve and the posterior interosseous nerve, which help to supply muscles in the forearm. The median nerve passes through the cubital fossa of the elbow, and for simplicity, one could imagine this as running down the midline of the front of the arm. The median nerve is quite robust, as it originates from the brachial plexus​, travels down into the forearm, and gives off more branches to supply muscles of the forearm and hand. The median nerve sends off two main branches after passing through the elbow as well. These are the anterior interosseous branch and the palmar cutaneous branch. The median nerve itself is also very well known for its role in c﻿﻿arpal tunnel syndrome, as it is the only nerve to pass through the carpal tunnel, and constant compression of the nerve can be quite painful. The ulnar nerve travels down the medial aspect (inside) of the arm to supply muscles in the forearm and hand, typically on the pinky finger side. When you hit your "funny bone", which often occurs by bumping the inside or underside of your elbow off a hard surface and results in a short-lived very uncomfortable feeling, you're actually hitting the ulnar nerve! The only blood vessel we will mention here is the brachial artery. It runs down the front side of the arm and crosses the elbow joint just beside the median nerve. The brachial artery is quite large and located rather superficially, and this makes it an ideal candidate for blood pressure measurements. This is the artery that doctors will place a blood pressure cuff over when measuring your resting blood pressure. Bursae (plural) are fluid-filled sacs located in and around many joints of the body. Their main function is to reduce friction, ultimately allowing for smooth movement of structures as they slide past one another, such as a tendon over a bone. Bursitis is a really common condition that is easily treated, but can be painful and result in some local, yet alarming, swelling. Here are the main bursae of the elbow joint. That's about it! This was a simplified version of the elbow joint anatomy touching on the main structures in and around the elbow joint. We know it can still be a lot to take in, and chances are a lot of this information is useless for you. However, understanding the anatomy of an injured area is often key to optimizing your treatment and really understanding what's going on. This knowledge allows you to have more effective discussion​s with your doctor or physiotherapist, provides yo with some tools to do your own basic research, and actually helps un understanding what movements may be good or bad for a particular injury. Hopefully some of you have found this helpful to some degree! We also have lots of other anatomy and injury information, as well as information about lots of braces used to treat various injuries, so feel free to explore the site and check out all of that as well!